Crammed into the busting-at-the-seams bottom drawer of my freezer is a collection of leftover bowls filled with… leftovers. There’s chili and chicken stock. And something that’s either more chili or possibly a meaty marinara sauce (I’ll find out for sure tomorrow – please let it be chili!). Last week, we took my visiting spring breaker niece and nephews to a local farm to pick strawberries. I had big plans for those strawberries (read: margaritas). And so did the kids (read: total, complete annihilation). Over 6lb of strawberries and there were less than a dozen left 24 hours later – and 3 of those shouldn’t count because they were put back into the basket with bite marks on them. (Gross.) Apparently, there are no such things as leftovers when growing kids are involved. They were bottomless pits with loads of aggression and the cutest East Texas accents which became less cute every time I had to put them in timeout for trying to drown each other in the pool. Or to celebrate the send-off of those visiting bottomless pits. 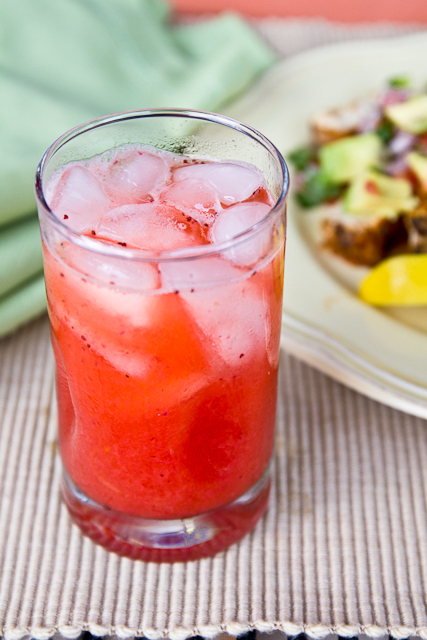 The resulting margarita is beautiful, refreshing, and fruity with plenty of strawberry goodness. Go ahead and save yourself the trouble – make a double batch. If you’re anything like me, you won’t have to worry about leftovers this time. 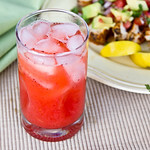 A margarita worthy of spring and summer, made with fresh strawberries, orange juice, and a homemade margarita mix. The strawberry puree was leftover from tossing 1 tsp of sugar with 1.5 pints chopped strawberries and then pureed after letting it sit at room temp for a while. You can adjust accordingly. Rim two glasses with salt or sugar, if desired. Stir the tequila, OJ, strawberry puree, and margarita mix together and pour over the ice. YUM! I just bought my first batch of strawberries for the season this week. These sound wonderful! My favorite instruction is #4. 🙂 Seriously, I enjoy strawberry margaritas, especially when strawbs are at their peak. A double batch sounds like a must! I can’t wait for strawberry season to get here. Those kiddos sound like my boyfriend who is also, coincidentally, a bottomless pit. But at least you got your margarita! 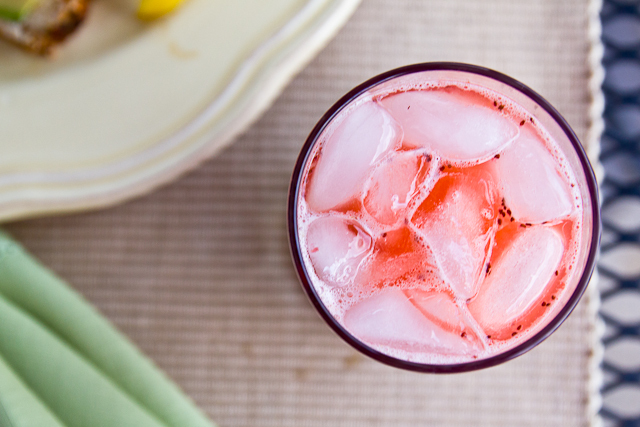 Yum, yum – love strawberry drinks! And, what is the delish looking dish in the background? I totally want this and it’s 9am. Awesome!! Made these last night and they were so good and so easy to drink! No oranges in the house, so I used triple sec. Can’t wait to have another couple tonight! I have an abundance of blackberry stuff (juice, whole berries, etc.) in my freezer… a fruit I think you covered in another post. The mention of your purée triggered my need to use some of it up before the season strikes again this summer! Nice recipe. I feel that agave is so unique that it meshes well with interesting fruits and juices. You can never go wrong with a fruit based margarita.